In hindsight – actually even in foresight, but let’s ignore that – soup + plated food for a dinner when there were too many people to seat everyone around the table was maybe not the wisest decision. In my defense, I did try to think of something else to make when I learned that there were going to be 10 people at Dinner this week. I futzed through epicurious looking for summer recipes, and I trolled a variety of my favorite blogs looking for inspiration, but when it came down to it all I really wanted to eat was corn soup and this decadent sounding tomato tart that I’ve been eying since David Lebovitz posted about it way back in May. All the other recipes I came across just left me bored, and nothing is worse than making food you find boring, because nothing will convince you that other people will like it if you yourself are bored by it. Frankly everything I did to the produce this week was overkill in the very best way. 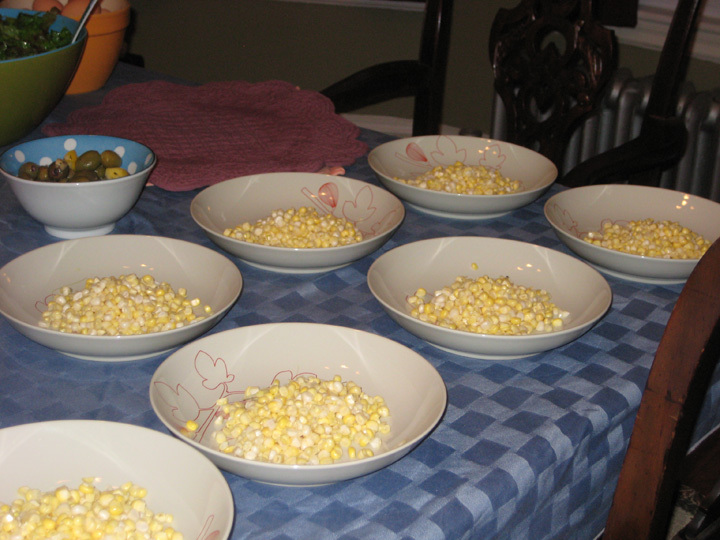 At the height of their season corn and tomatoes don’t need anything done to them to be spectacular, as evidenced by the quantity of freshly shucked corn kernels I snacked on while I was making the soup, and the number of grape tomatoes that never made it to the salad bowl. But if you felt like indulging in excess, adding bacon, goat cheese, honey and over a stick of butter to the proceedings is definitely the way to go. It’s possible I went slightly overboard and served too much food – although I tend to think you can never over estimate how much food will disappear at Dinner. In my defense, the tart was divided into 10 pieces (and that was an exercise in geometry – the only thing that stopped me pulling out a protractor to measure a precise 36 angle was the fact that it’s been a long time since I was in high school and I no longer own a protractor), and the corn soup is light, and everything else makes for useful leftovers. Although, as it turned out the only thing I really had leftover was hard boiled eggs, and I’m not worried about those lingering too long in my fridge (see above comment about Dinner and the perils of over estimation). On a mostly unrelated note (although the two full bags of produce I took home on Wednesday might argue that it’s not entirely unrelated), if you live in the Boston area consider emailing Governor Patrick in support of a year-round Boston Public Market. “Today, Boston has more than twenty seasonal, open-air farmers markets, the two most prominent at City Hall and in Copley Square. But after two and one-half centuries, the city has lost its year-round central marketplace. Citizens, community groups, restaurants and government agencies have expressed enthusiasm for a Boston venue that serves as an outlet for Massachusetts farm and food products and as a support for local entrepreneurial activities. I’m all in favor of it, but then I work downtown and really want somewhere to buy fresh produce year round, so it’s possible I’m a trifle biased. My mother sent me an email on Tuesday detailing her weekend’s worth of kitchen related semi-disasters, most of which seemed to revolve around attempting to make pie dough in the middle of the summer. So, it was with trepidation that I went home on Tuesday night and prepared to make pie dough. I don’t like making pie dough at the best of times, and I wasn’t inspired by my mother’s tales of woe (particularly since she usually can make pie dough). However, this is the world’s most forgiving pie dough mostly because there’s so much butter in it that it practically comes together before you add the liquid. I let mine rest in the fridge for 20 minutes or so before I tried to roll it out, and it then rolled out beautifully and I tucked it into the tart pan without a single mishap, and there are honestly very few times I ever say that about pie dough. For those of you who find the throwing away of dough scraps to be sacrilegious, don’t fret. I rolled them out and dotted them with jam and baked them up for a snack before dinner on Tuesday night. Mix the flour and salt together. 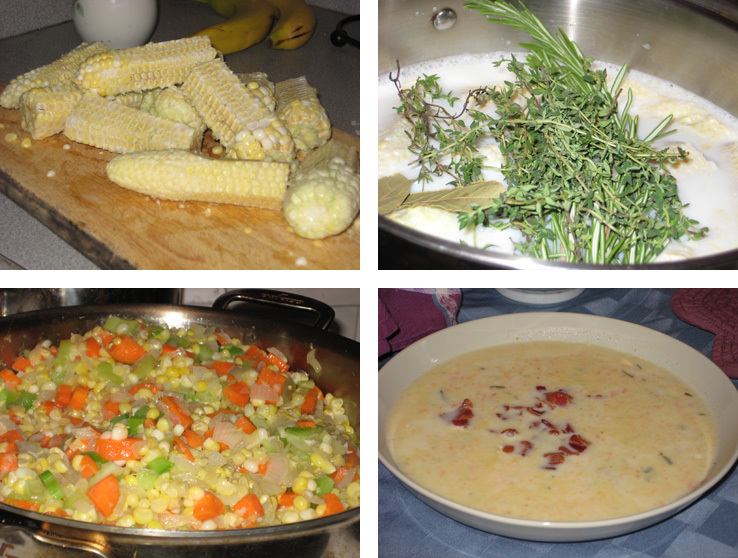 Cut in the butter until mixture resembles coarse cornmeal. Make a well at the center of the bowl. Mix the egg and 2 Tbsp water together. Add to the flour and mix until dough comes together. Add extra tablespoon of water if necessary (it really really wasn’t for me). Allow to rest for 20-30 minutes in the fridge. Roll out on a floured board, using just enough flour to prevent the dough from sticking. Transfer to a 9” or 10” tart pan. Dock the dough with your fingertip, pressing in to make indentations. Spread an thin layer of mustard over the bottom of the tart dough and let it sit a few minutes to dry out (he doesn’t say how much – I used 2 Tbsp, use more if you like more bite). 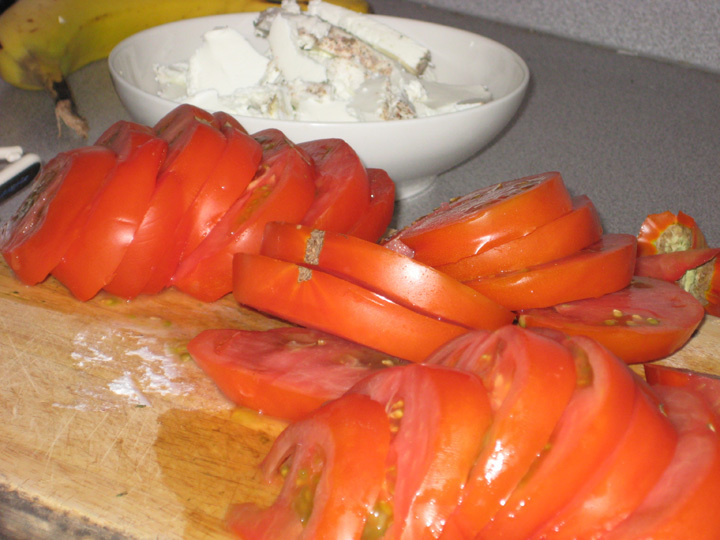 Slice the tomatoes and arrange them over the mustard in a single, even layer. Drizzle the olive oil over the top. 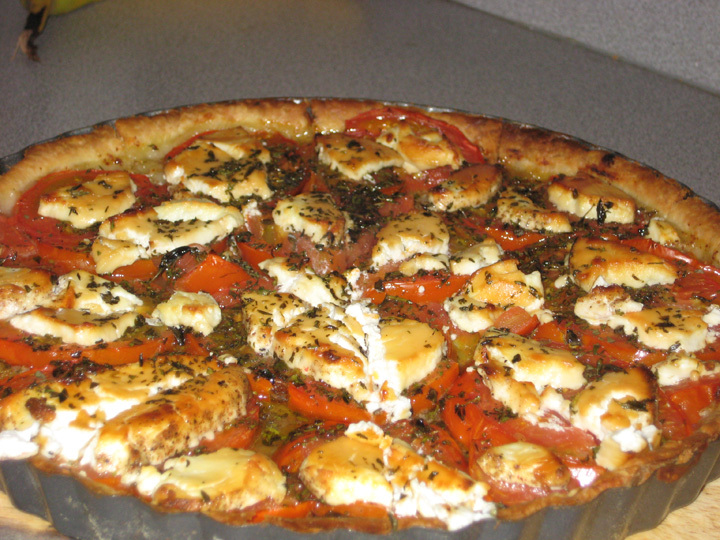 Sprinkle with half the chopped fresh herbs, then arrange the slices of goat cheese on top. (I’m not sure how David Lebovitz got 8 oz of goat cheese onto his tart, I managed to squeeze about 6oz on to mine, and I think that was plenty). Add the rest of the fresh herbs, then drizzle with the honey. 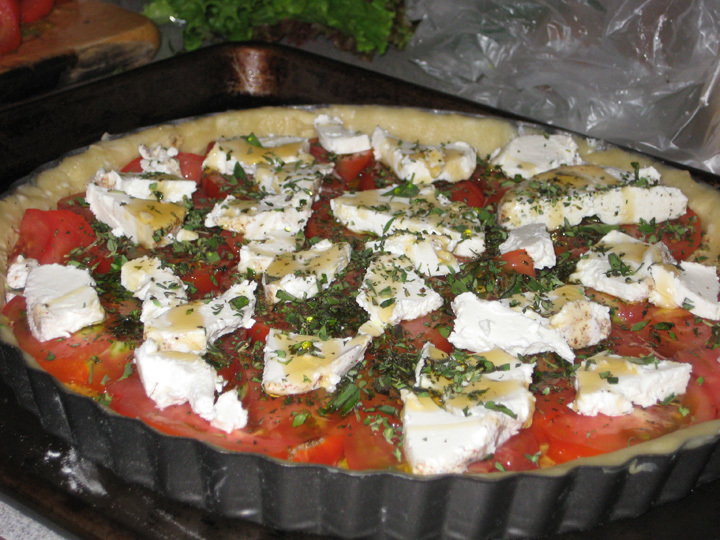 Bake the tart for 30 minutes or so, until the dough is cooked, the tomatoes are tender, and the cheese on top is nicely browned. Depending on the heat of your oven, if the cheese doesn’t brown as much as you’d like it, you might want to pass it under the broiler until it’s just right. David Lebovitz says you can also make this as a free form tart – roll the dough to a 14” circle and transfer to a baking sheet on a piece of parchment paper. Assemble the tart filling as above, leaving a 2” border. Fold the border over to enclose the filling, and bake as above. He also recommends that you check on the tart about half way through cooking to make sure that it isn’t burning on top before it’s ready to come out of the oven. If it seems like it’s getting too brown, just turn your temperature down a little and continue to cook. 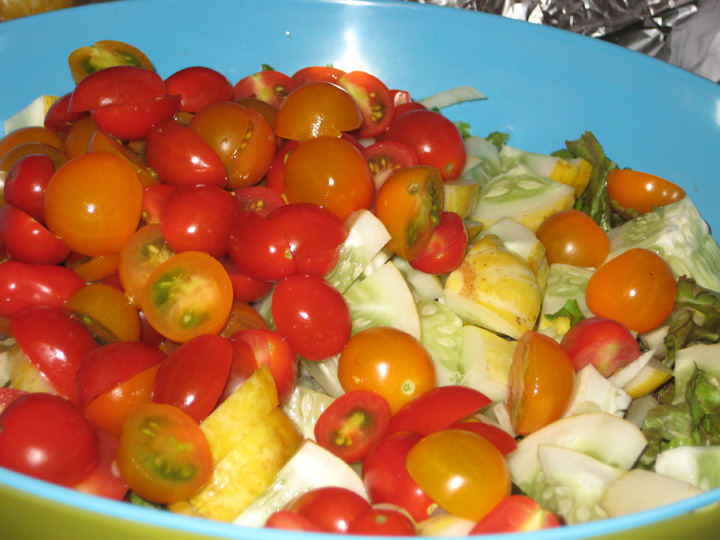 With a rainbow of grape tomatoes, lemon cucumbers, and a little fennel for crunch (and because it was sitting there in a tempting pile at the farm stand). 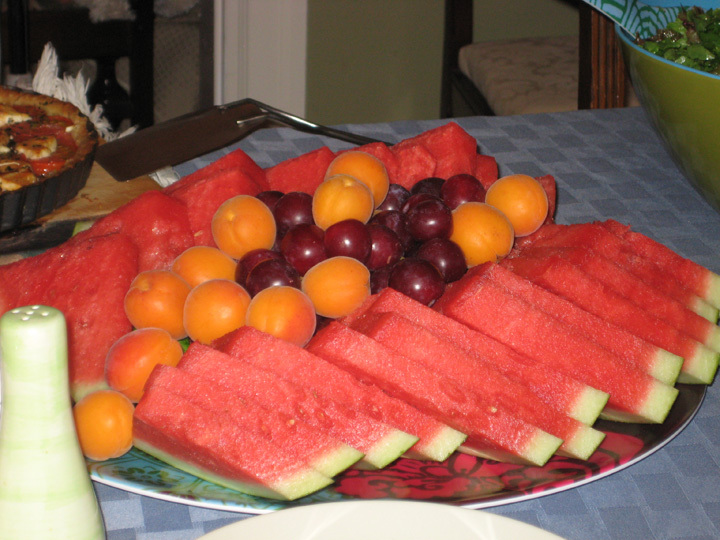 I spent the afternoon getting vaguely drunk off the smell of the fresh fruit perfuming the air.